So the FrankenStatus is made up of 2 main bits – the electronic/Arduino bits (that I’ll write about in the next post) and the Raspberry Pi. There’s a couple of things on the Pi to make it all come together, most of which are entirely optional but made my life easier. One of the issues that I ran into previously with the Raspberry Pi was that without a screen attached to it (as is the case with the FrankenStatus), I don’t know the IP address that it has DHCP’d. Last time I solved it by simply hard coding the IP address, but this time I decided to make it a bit more dynamic. I use the excellent Pushover Notifications App for sending myself custom notifications and since they have a simple REST API, it was quick and easy to work out the IP address and send it directly to my phone. Once you have the Pushover app and are registered on their site, you will need to log in and create an application. I also added an icon for it to differentiate from the other messages I receive. When you create an application you will get an API auth token to use when sending your messages. curl -X POST -d "token=putyourpushoverauthtokenhere&message=$(ifconfig wlan0 | grep 'inet' | cut -d ':' -f2 | cut -d' ' -f1)"  "https://api.pushover.net/1/messages.json"
The sleep function is a hack to make the script wait until the networking has initialised properly. There’s a neater way to grab the IP address (see later), but this worked at the time. 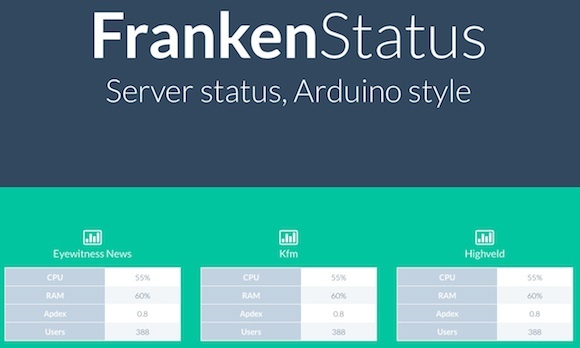 The FrankenStatus shows me status at a high level, and so I decided to set up a simple web server so that I could get the latest exact status values. Even though I had the local IP address of the Raspberry Pi, I might not always be on the same network, so decided to make the web server available outside of the local network. To do this I turned to ngrok – “secure introspectable tunnels to localhost”. If you do any kind of web development on your local machine and want to be able to show people without deploying it to an internet accessible server, ngrok is the way to go. Basically it exposes the port you specify on your local machine as a dynamically generated hostname on ngrok.com. However if you register on the site (and pay a small fee – $2 a month), you can choose and reserve your own host name. Under the tunnels section I created a named tunnel called arduino and specified the subdomain I wanted to use. I used something fairly specific that I knew would probably always be available, but if you want to be safe, just go pay the $25 for a year – it’s worth it. You also need to specify the protocol that will be proxies through and the port to listen to on the local machine. Since it’s a web server, http and port 80. For the Raspberry Pi a Linux/Arm executable is available on the ngrok page, just click through to More platforms on the Download page. check process ngrok matching "/usr/local/bin/ngrok -config /etc/ngrok start arduino"
start program = "/usr/bin/screen -d -m /usr/local/bin/ngrok -config /etc/ngrok start arduino"
stop program = "/usr/bin/killall ngrok"
the check process matching lets you use the command name to search the process list – be sure to use the full command with all arguments when matching otherwise it won’t find it. Because ngrok generates a lot of useful information, and doesn’t normally run in the background, I’m launching it with screen so that I can attach to the process if I need to debug anything. You then tell ngrok what config file to use (the one we created earlier) and which named tunnel to start. row = settings.db.get_first_row "select data, updated from data order by updated desc limit 1"
All I needed to do was grab the most recent results that the update script had received (as you’ll see later, I store those in the raw format that I use to send to the Arduino), grab the IP address (by this time I had come to my senses and was using hostname -I to get the IP address) and then pass them through to a template file. The template simply showed the specific value for each of the servers, using the tuktuk CSS framework. It’s probably a good idea to also load this and the Sinatra web server up with Monit to make sure that they continue running, but for the time being this worked fine. You would obviously need to replace the placeholders in the settings file with your New Relic API key and the specific application ID’s of the apps within New Relic that you wanted to track. The New Relic API returns JSON, so we need to be able to interpret that and Faraday is a decent gem for making HTTP REST request. YAML is needed to parse the settings file we created earlier and serialport is used to send data to the Arduino through the USB port. I’m using a simple SQLite database to keep a log of the data we get back and using the Google API Client. Load the contents of the settings.yml file and store in the settings variable. For this to work you need to apply for access to the beta of Google’s Real Time Reporting API. When you have access you can go ahead and create an application within the Google Cloud Console. You can create the application before you get access, but as soon as you try make the API call you will get a not authorised message. You will need to pass the application name into the function to create a new api client. When you create the application in Google Cloud Console, go to the APIs & Auth section, select Registered apps and click through to the application you just created. There are 4 options for authentication – expand the Certificate option and click Generate New Key. This will generate a public key – download it and save it in the same directory as your grabStatus script – it will be named with a random number and a .p12 file extension. At the same time a random @developer.gserviceaccount.com email address will be generated, make a note of that: the next step in connecting to the Google API and authentication is to load the PKCS12 file, passing in the path to the key file you just downloaded and the passphrase you used. You can then create an asserter by passing in the email address that was generated when you created the key, the authentication endpoint and the key object you created earlier when loading the key file. You can then authorise and select the API that you want to use. At this point the analytics object in the ruby script is authenticated and has chosen to connect to the Analytics API. Every time you make the serial connection it resets the Arduino board, so you’ll want to make the connection once at the beginning of the script and then hold the script open. Again, to make sure that all of the network connections have come up, wait a bit before kicking off the network connection, open the database and then begin the loop that will check for the settings. The first thing to do with New Relic is grab the details of the application. Apdex is a range from 0 to 1, the higher the number the better. Since all of our data is based on percentage where the less usage is better, I invert the ApDex score and convert to a percentage. Now that all of the RAM and CPU values are in arrays, we can work out the average for each, as well as the maximum value for both RAM and CPU. The last line is asking for the maximum value out of the maximum RAM, maximum CPU and ApDex. Later on when we start displaying the data physically we’ll use the maximum of all indicators for a specific application as the one we want to show (as this is the thing you want to be worried about). Our two music sites run off the same pool of servers, so the New Relic stats will be the same for both (same servers) but the GA stats will be unique to each site. A better idea would be to retain a log of the maximum users seen on the site, and use that value in an Arduino map function to convert to the millisecond range. At this point you should have the latest values being pushed to the Arduino in 2 minute intervals, as well as a web interface to see what the actual data values are.